I’ve been accumulating a bunch of tidbits/links recently that I’ve been wanting to post about. None of them on their own seemed to warrant a post of it’s own. But I think I have accumulated enough now to get a post together. Bear with me. It will be a rambling ride. Before I get to all of my randomness, let me mention that it is my beloved’s birthday today. (yes, October is a busy month for us. And we still have one more after this) He is 37 today. I am so thankful he was born! I love him dearly and he keeps me sane and grounded. Happy Birthday, P! *updated to add a request* please pray for him. He seems to have some sort of stomach issues going on. This time last year he ran into the same issues and the doctors couldn’t determine what it was. It went away on its own eventually. But it took awhile and was very uncomfortable in the meantime. Not only is his health a concern, but the fact that he is out of sick days at work (due to a severe flu episode 2 weeks ago and then Declan’s hospitalization last week). As it is, we are only receiving a paycheck this Friday for just 3 days of work. Please pray for Sean’s healing; specifically a touch from the Lord that will take away his stomach troubles. Also, please pray specifically for healing on our family. We have been very ill and used up our emergency funds on *emergencies*. Now we need to recover financially from that and I find myself worrying about something else happening in the meantime. I know the Lord is faithful and will provide. And thank you for your prayers. I was reading WonderTime magazine Saturday and found an article on geocaching. I am hooked on the idea of it and have already told Sean that I must borrow his GPS this coming weekend. When Abbie found out that she could go digging for candy, she was ready to go NOW! Tell me that doesn’t sound like something the kids would absolutely love!! It’s like being a pirate – but without the ship and water. There is a site – Geocaching.com – that you can visit for locations of caches, log your finds etc. I checked our zip code and there were over 200 caches buried within 50 miles of it. Let me know if you decide to do this and what you think. 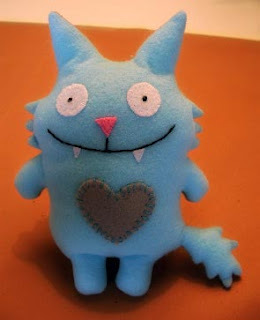 Click here for a Flickr tutorial on how to make this little guy (or some little monster your own child draws up.) The tutorial includes photos and written instructions. I would love to see my little guys in this hat. 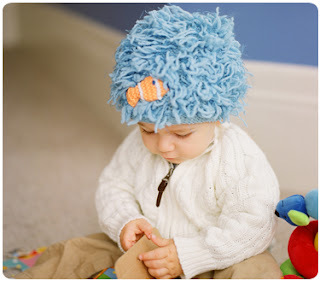 Thanks to MomFinds.com, I came across these cute hats from Zooni.com. Handmade and adorable. I came across this link via The MotherLoad. Gorgeous, cheery kitchen paint job. 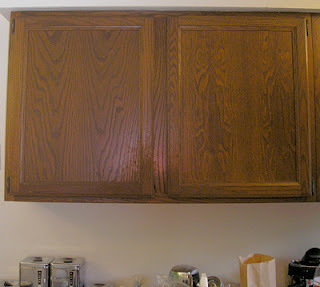 Click here to see what Amy at DayLab DIY did to these cabinets. To close, I’ll mention that Declan is doing very well. When he went to the doctor’s on friday, he weighed in at a respectable 8# 8oz! Amazing, considering that on the day he was taken to the ER (just 5 days earlier) he was 8# 2oz… And even more so considering he was 5# 11oz at birth, just 6 weeks before. Ooh, thanks so much for the little monster tutorial. I will have to whip one up this weekend! Eek! So many excellent links! I want to make a monster too! So sorry I haven’t been “around” lately – I haven’t had much computer time. Happy birthday to Sean! My prayers are with all of you for your physical as well as your financial needs. Had breakfast with your mom this morning and several ladies from church…we had a good time. There was only half-day of school this afternoon so Beth’s youngest, Katherine, went along…she’s a Ms. Socialite. i’ll pray for your hubby. i love your random posts! Karla, I loved the link about the right-brain/left-brain thing. At first I saw it going clockwise . . . then I did some reading and looked back at it again and it’s anti-clockwise. I tried to “get it” to go clockwise again, but I couldn’t. So, I’m not sure what that means for me . . . right brain or left brained? In any case, it was fun!